Many traditional buildings in Edinburgh have a slate roof. Scottish slates varied in size bring produced in different lengths and widths. The lower roof had the larger slates installed gradually reducing in size as the roofers worked there way up the roof. This allowed the roofers to use most of the slate that was quarried and was introduced mainly for economic reasons. In addition to this some roofs reducing in pitch as the near the wall head this also requires larger slates to further reduce the chance of water penetration with the pitch reducing and the increased catchment area of the roof having a higher volume of water to shed. 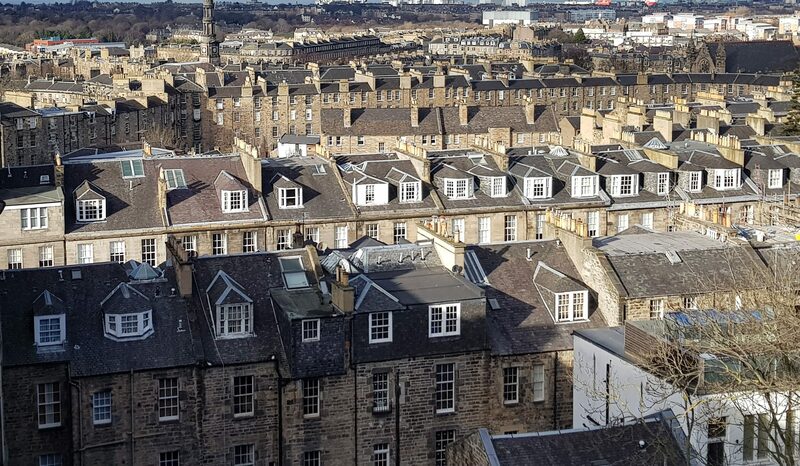 Edinburgh roofs tend to be steep, with slopes of around 40°. Steep roof pitches are less likely to the allow wind-driven rain or snow under the slates. with water quickly running off the roof minimising the chance of ingress issues. Slate has a good reputation as a robust long-lasting material. many slates having a service life of 150 years. To achieve this longevity, fixings and support require repair and maintenance. It is good practice to inspect roofs at regular intervals, repairing any potential problems as soon as they appear. This is particularly important as slate has not been quarried in Scotland since the 1950s, supplies of Scottish slate for matching repair and replacement are becoming very hard to come by. Regular inspections are essential to spot and tackle problems, dealing with these problems quickly before allowing these problems increase – escalating repair costs. Pre-winter roof inspections and repair work in the autumn months is recommended. It is also advisable to repeat the inspection after a particularly severe storm or gale. MGF Roofing carries roof surveys and inspections with use of UAVs and Rope Access Teams. Evidence of any problems is recorded and any items of concern listed along with redial actions and estimated repair costs. Slates undergo changes that affect their performance on the roof over a period of time. Testing for this change is relatively simple, by holding a loose single slate at its edge and gently tap it in the centre with a hammer. This should produce a clear ringing sound if the slate is sound. If a dull, dead, sound is emitted it is likely that the slate has become porous and is now at the end of its life. • nails being driven in too far hold the slate too firmly against the sarking causing any movement to damage the slate excessively. • nails not being driven into the sarking far enough, with the nail head standing proud from the slate. This is likely to damage slates in the courses above as the slate will sit on the nail head and not bear down evenly on the underlying slate, also allowing excessive movement increasing wear odf the slate. Identifying slate damage and the amount of work required is relatively simple. Look along the bottom of the slates in a single course. Any slates that are out of alignment are probably loose and likely to require attention. Repeating this process on each course across the roof, keeping a note of the number of affected slates. A general rule, if more than 20%-25% of the slates are damaged, loose, or missing. Its generally more cost effective to strip the entire roof than try and repair the affected areas. If major reslating work is required, it is advisable to contact the local planning authority to check if planning permission or listed building consent might also be needed. 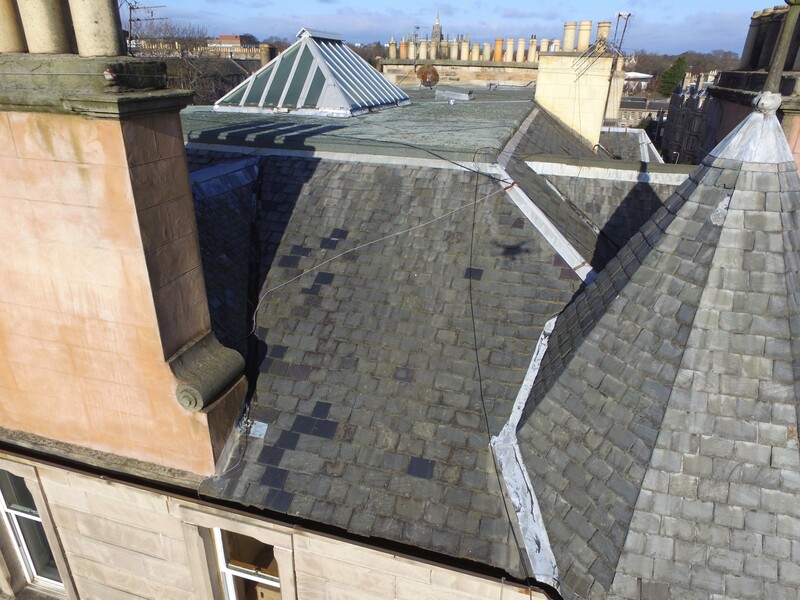 In the light of the difficulties in sourcing large quantities of Scottish slate, the existing roof covering should be recorded in detail prior to dismantling. 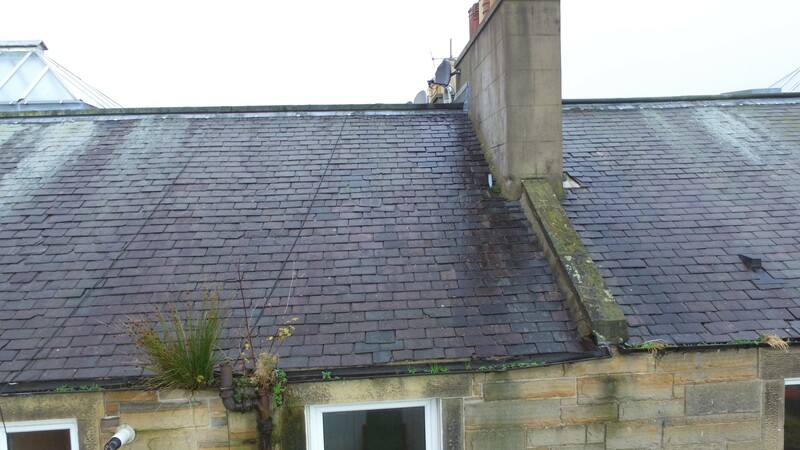 Water penetration can occur if slates have been incorrectly selected and laid. The correct overlaps are required on each roof pitch ensuring that the chance of water penetration is reduced. the For example, shallower roof slopes require larger slates where the water runoff is slower and is more likely to seep through joints. Wider slates are also required at roof junctions and intersections so that they can be more appropriately secured. Slates fixed using iron or poor quality galvanised nails are more likely to suffer from nail sickness. Whilst it is rare for all the nail fixings across an entire roof to reach the end of their service life simultaneously, progressive deterioration of the nails can lead to numerous slates in the same area becoming loose and slipping out of place. 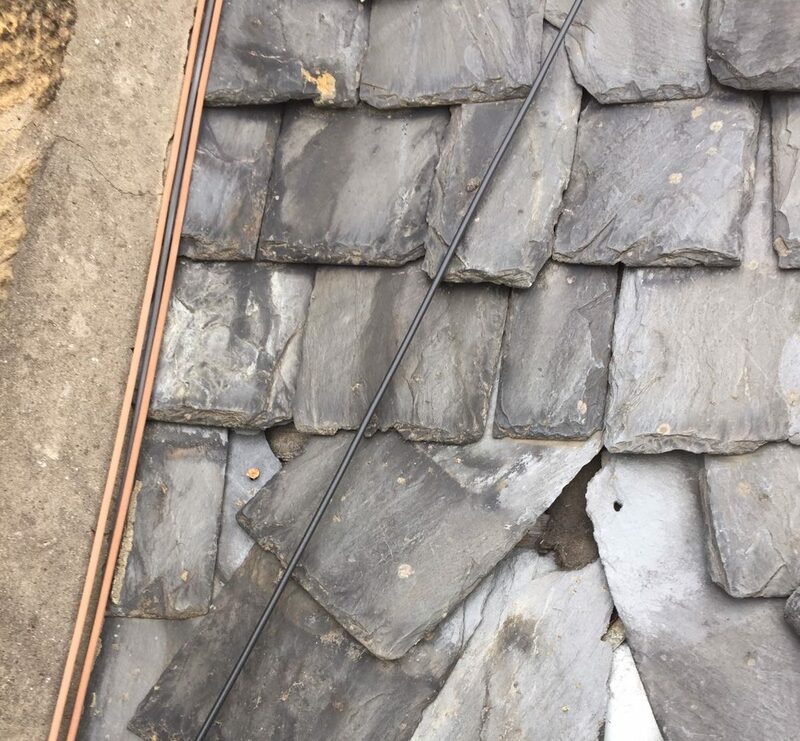 This may also be caused by the decay of the slate around the nail hole or decay of the sarking, in these circumstances, complete stripping and reslating will be required. 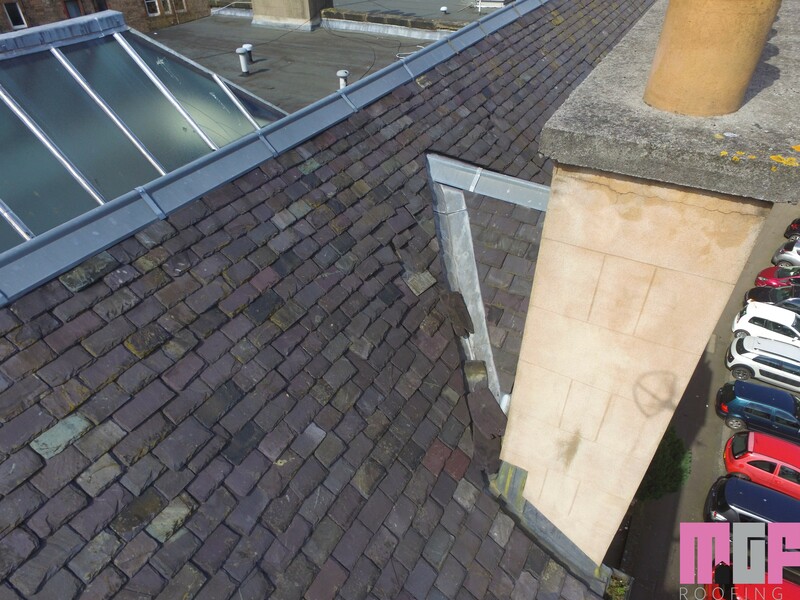 What is involved in repairing a Scottish slate roof? 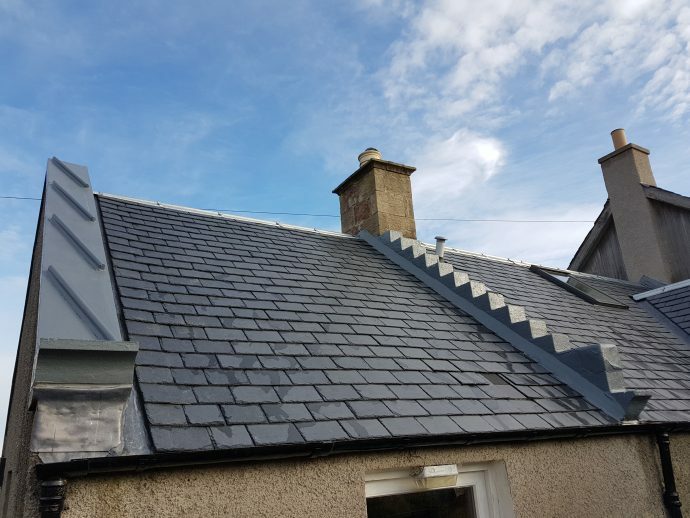 Regular maintenance of a slate roof should be relatively inexpensive, with the occasional replacement of a handful of slates being all that is necessary. It is important to select any replacements carefully. Attention should be paid to their size, texture, thickness, weight and colour. If it is not possible to precisely match the existing slates, a slightly lighter colour for the replacement should be chosen rather than a darker hue as this will help it to blend in better.